The show was a typical Blues Explosion belter, with the added treat of getting a backstage pass and full access to the dressing room rider fridge (probably a good place to apologise to Misters Judah Bauer & Russell Simins for draining so many cans of ale – we got proper carried away). Can’t help but imagine all the rock, punk and indie acts that have graced the stage there over the past decades… the place reeks of history, hairspray and spilled beer. (so £35 for now – don’t hesitate!). 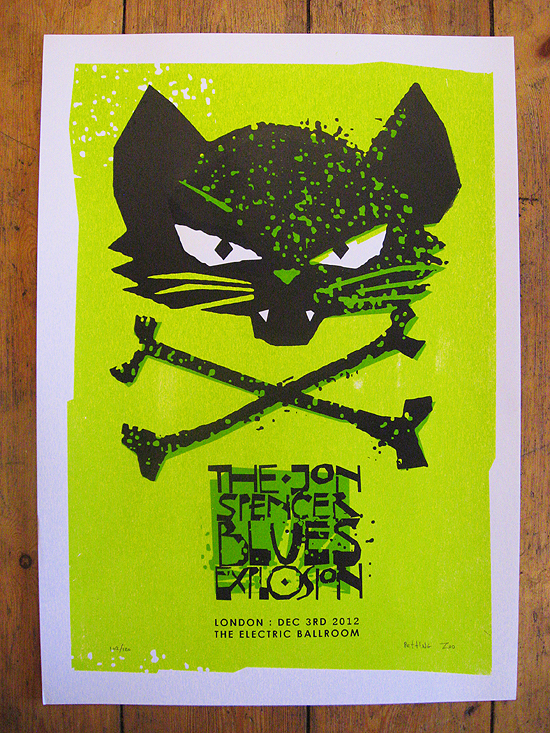 This entry was posted in Gigposters, Screenprints and tagged affordable art, animal print, art, black mold, Blues explosion, camden, cat, cat print, collectables, commission, electric ballroom, gig, gigposter, illustration, Jon Spencer, jsbx, Judah Bauer, limited edition, London, music video, Petting Zoo Prints & Collectables, poster, print, rock n roll, Russell Simins, screenprint, serigraphy, the jon spencer blues explosion. Bookmark the permalink.